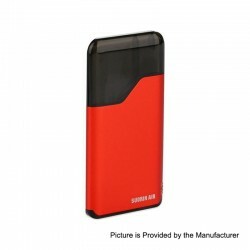 The Original Suorin Air is a game changing all-in-one device that is redefining the term "stealth vaping". Smaller than a credit card, and slimmer than a standard ballpoint pen; the Suorin Air features a 400mAh rechargeable battery and 2ml refillable pod which provides incredible battery life and liquid capacity for a device of such diminutive dimensions. Incorporated into the design is a master on / off switch and subdued battery life indicator light which is activated when the device is firing and charging. An extremely efficient design, there are no buttons, screens, or complicated settings; the device is instantly activated through inhalation. The Suorin Air is manufactured with excellent build quality and exacting tolerances which provide a rarely matched level of reliability and durability. Whether you are seeking to streamline your setup, add a reliable backup, or start with a stylish and dependable device; the Suorin Air is the device you've been waiting for.